Marbocyl is indicated in the treatment of skin and soft tissue infections (skin fold pyoderma, impetigo, folliculitis, furunculosis, cellulitis), for the treatment of urinary tract infections associated or not with prostatitis and respiratory tract infections, caused by susceptible strains of organisms. 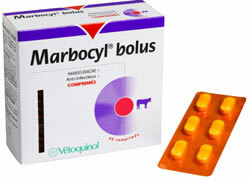 Marbocyl is indicated for the treatment of skin and soft tissue infections (wounds, abscesses, phlegmons) and upper respiratory tract infections caused by susceptible strains of organisms. Not suitable for infections resulting from strict anaerobes, yeast or fungi. Do not use Marbocyl P 20mg or Marbocyl P 80mg tablets in cats. For the treatment of this species the Marbocyl P 5mg tablet is available. The fluoroquinolones have been shown to induce erosion of articular cartilage in juvenile dogs and care should be taken to dose accurately, especially in young animals. The fluoroquinolones are known for their potential neurological side effects; cautious use is recommended in dogs and cats diagnosed as suffering from epilepsy. A low urinary pH could have an inhibitory effect on the activity of marbofloxacin. Studies in pregnant rats and rabbits showed no side effects on pregnancy. However, no specific studies have been carried out in pregnant cats and dogs. Fluoroquinolones are known to interact with orally administered cations (Aluminium, Calcium, Magnesium, Iron.) In such cases, the bioavailability may be reduced. Marbocyl 2% is presented as a sterile solution for injection. In pre-ruminant cattle up to 100kg bodyweight and pigs, Marbofloxacin 2 % is indicated in the treatment of respiratory infections caused by susceptible strains of organisms. The recommended dosage is 2 mg/kg/day (1 ml/10 kg) in a single daily injection by subcutaneous or intravenous routes in cattle and by the intramuscular route in pigs. Treatment duration is 3 - 5 days by the intravenous route in cattle,. 3 days by the subcutaneous route in cattle,. and 3 - 5 days by the intramuscular route in pigs. The volume of injection should be limited to 10ml at each site of injection for pigs. In order to reduce the risk of particulate contamination of the product, it is recommended that a draw-off needle be used to reduce the number of times the septum is punctured. Official and local antimicrobial policies should be taken into account when the product is used. Fluoroquinolones should be reserved for the treatment of clinical conditions which have responded poorly, or are expected to respond poorly, to other classes of antimicrobials. Wherever possible, fluoroquinolones should only be used based on susceptibility testing. Use of the product deviating from the instructions given in the SPC may increase the prevalence of bacteria resistant to the fluoroquinolones and may decrease the effectiveness of treatment with other quinolones due to the potential for cross resistance. No severe side-effects are to be expected at doses up to 5 times the recommended dose in cattle and pigs. In particular no lesions of the articular joints are encountered. Subcutaneous injection is well tolerated. Transitory inflammatory reactions are sometimes observed at the injection site, but without clinical impact. People with known hypersensitivity to fluoroquinolones should avoid using this product. Wash hands after use. Manure and slurry containing marbofloxacin should not be spread on the same area of land in successive years. Packaged in amber type II glass vials of 10, 20, 50ml, 100 ml and 250ml. The vials are closed with a chlorobutyl rubber stopper oversealed with aluminium caps. Each vial is packaged in a cardboard box. Marbofloxacin is a synthetic, bactericidal antimicrobial, belonging to the fluoroquinolone group which acts by inhibition of DNA gyrase. It is effective against a wide range of Gram positive bacteria (in particular Staphylococci) and Gram negative bacteria (Escherichia coli, Salmonella typhimurium, Campylobacter jejunii, Citrobacter, Enterobacter, Proteus spp, Klebsiella spp Actinobacillus pleuropneumoniae, Bordetella bronchiseptica, Pasteurella haemolytica, Pasteurella multocida, Haemophilus spp, Moraxella spp, Pseudononas aeruginosa) as well as Mycoplasma (Mycoplasma bovis, Mycoplasma dispar, Mycoplasma hyopneumoniae). Resistance to Streptococcus may occur. After subcutaneous administration in cattle and pigs at the recommended dose of 2 mg/kg, marbofloxacin is readily absorbed and its bioavailability is close to 100 %. It is weakly bound to plasma proteins (less than 10 % in pigs and 30 % in cattle), extensively distributed and, in most tissues (liver, kidney, skin, lung, bladder, uterus, digestive tract), it achieves higher concentrations than in plasma. In cattle, marbofloxacin is eliminated slowly in pre-ruminating calves (t1/2β = 5-9 h) predominantly in the active form in urine (3/4) and faeces (1/4). In pigs, marbofloxacin is eliminated slowly (t1/2β = 8-10 h) predominantly in the active form in urine (2/3) and faeces (1/3). In cattle: Indicated in the treatment of respiratory infections caused by susceptible strains of organisms. It is also indicated in the treatment of acute E.coli mastitis. In pigs: Indicated in the treatment of Metritis Mastitis Agalactia syndrome caused by susceptible strains of organisms. The recommended dose rate is 2mg/kg/day (1ml/50kg) in a single daily injection by intramuscular, subcutaneous or intravenous routes in cattle and by intramuscular route in pigs. Treatment durations are 3 days in pigs and 3 to 5 days in cattle. Milk for human consumption must not be taken during treatment. Milk for human consumption may only be taken from cattle after 36 hours from the last treatment. Animals must not be slaughtered for human consumption during treatment. Cattle may be slaughtered for human consumption only after 6 days from the last treatment. Pigs may be slaughtered for human consumption only after 4 days from the last treatment. General precautions: No severe side-effects are to be expected at doses up to 3 or 5 times the recommended dose in cattle and pigs respectively. In particular, no lesions of the articular joints are encountered. Intramuscular or subcutaneous injections are well tolerated although transitory inflammatory lesions without clinical impact can occur at the injection site. May be used in pregnant and lactating cows and sows. Do not store above 25°C and protect from light. Following withdrawal of the first dose, use the product within 28 days. Any unused material should be discarded. Amber type II glass vials of 20, 50, 100 and 250ml. The vials are closed with a chlorobutyl rubber stopper oversealed within aluminium caps. Each vial is packaged in a cardboard box. Not all pack sizes may be marketed. Marbofloxacin is a synthetic, bactericidal antimicrobial, belonging to the fluoroquinolone group which acts by inhibition of DNA gyrase. It is effective against a wide range of Gram positive bacteria (in particular Staphylococci) and Gram negative bacteria (Escherichia coli, Salmonella typhimurium, Citrobacter freundii, Enterobacter cloacae, Serratia marcescens, Morganella morganii, Proteus spp, Klebsiella spp, Shigella spp, Pasteurella spp, Haemophilus spp, Moraxella spp, Pseudomonas spp) as well as Mycoplasma spp. After subcutaneous or intramuscular administration in cattle and intramuscular administration in pigs at the recommended dose of 2mg/kg, marbofloxacin is readily absorbed and reaches maximal plasma concentrations of 1.5microgram/ml within less than 1 hour. Its bioavailability is close to 100%. It is weakly bound to plasma proteins (less than 10% in pigs and 30% in cattle), extensively distributed and in most tissues (liver, kidney, skin, lung, bladder, uterus, digestive tract) it achieves a higher concentration than in plasma. In cattle, marbofloxacin is eliminated slowly in pre-ruminating calves (t1/2β = 5-9h) but faster in ruminant cattle (t1/2β = 4-7h) predominantly in the active form in urine (¾ in pre-ruminating calves, ½ in ruminants) and faeces (¼ in pre-ruminating calves, ½ in ruminants). In pigs, marbofloxacin is eliminated slowly (t1/2β = 8-10h) predominantly in the active form in urine (2/3) and faeces (1/3). Below are some recent questions we've received regarding Marbocyl, including answers from our team. Is Marbocyl available in a liquid oral form for reptiles. Would there be an adverse reaction giving the injectable for orally to a reptile? Strictly speaking this is something only your vet can advise you on, because he/she knows the full details of the case. I can say however that the injectable solution has been used in reptiles, either for injection or given orally, and it is regarded as generally safe and effective. The "recommended" dose is 10mg/kg every 2 days, but this is an unlicensed use and only your vet can advise on the specific risk/benefit analysis.